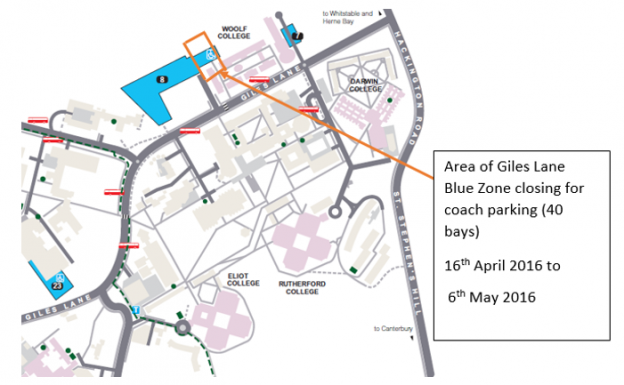 To assist with Kent Hospitality Conference Guests and School Visits to the University a coach park is being installed in Giles Lane Blue Zone car park in the area behind Woolf College from 15 April 2016 to 6 May 2016. 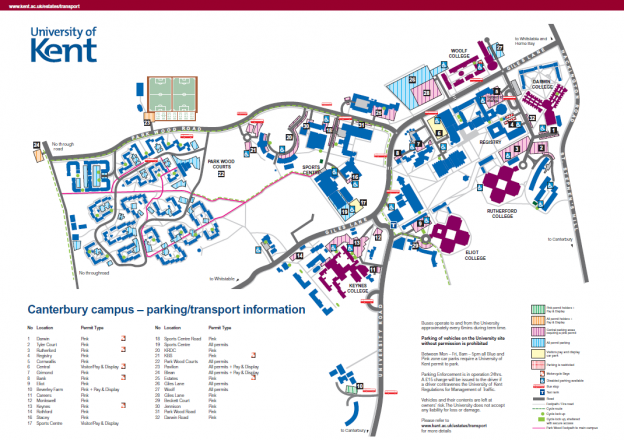 As this is during the vacation period parking should still be available within the central campus car parks however please be aware if these do become full then use the car parks within the Park Wood area, including the parking bays available next to the Park Wood accommodation. This entry was posted in News and tagged parking on April 14, 2016 by Miriam Sandiford. Enrolment Management Services will be holding an Applicant Day on 6 April 2016 at the Canterbury campus. These are essential recruitment events for the University. To assist with this event 189 parking bays will be closed in Giles Lane blue zone car park. This entry was posted in News, Uncategorized and tagged parking on April 4, 2016 by Miriam Sandiford.